Now more than ever online reviews can be the difference between a successful local business and one that doesn’t beat the overwhelming odds against small companies in today’s world of big brands and online marketing. We don’t look up businesses in a phone book anymore. We Google for them on our laptops, tablets and smartphones. And most of us do our research. Whether looking for a new barber, dentist or plumber, we want to know what other customers have to say about any product or service and the business behind it before making a purchasing decision. Google knows this. That’s why they rely so heavily on popularity to determine which businesses appear in search results. Savvy business owners know that the best way to garner lot’s of great reviews is to always provide great value and superior service. But that may not always be enough to get your best customers to take the time and effort to review your business. If your website doesn’t already have a Reviews page, create one ASAP; it may be the most important page on your website. Here’s how. Start by creating a URL that’s easy to rembeber. We typcially recommend using mycompany.com/reviews. Why do you keep coming back to our business? How do our doctor(s) and staff help make your visits as comfortable as possible? What impact has our business had in your life. For example a dentist could ask patients if they feel more confident in their smile, dental pain relief, etc. Would you recommend our business to friends and family and why? Write down the answers and help the customer craft a brief (2-3 lines) review. Ask them to approve the review and sign a simple release form allowing you to use their testimony. Use their first name, last initial and the city in which they reside (optionally if the customer is uncomfortable providing last initial and city, you can use just their first name). At the top of your Reviews page make it easy for new customers to go to their favorite reviews site and post new reviews. 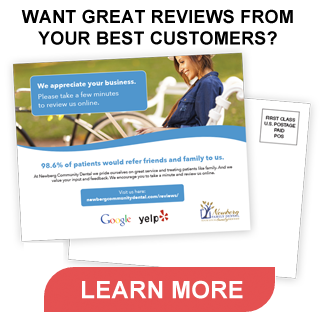 Add new customer reviews to your Reviews page every month. Remember; you can’t control what customers write on Yelp, Google, etc. but you can control the reviews on your own website! If you use WordPress you can install a Reviews Plugin and allow customers to post their reviews directly on your website. This may not give you as much SEO love as reviews on Google and Yelp but at least you own and control all reviews on your own site! What’s the primary purpose of your local business website? It should be to get customers to call for an appointment or drop by your location. It doesn’t matter if you think it looks great. In order to help your business grow your website needs to grab a prospect’s attention and convert them into a paying customer. No more, no less. That’s where the CTA (call-to-action) comes into play. A great CTA makes it clear what makes your business unique and valuable. You can say you’re customer friendly all day long, but what we customers really want to know is what other customers think about your value. What a great CTA! Use banners, call outs, sidebar widgets, etc. to direct website visitors to your Reviews page. Citing the percentage of customers who would reccomend your business to friends and family is a great way to get their attention and encourage them to view the page. Once you’ve created a Reviews page you’ll need a way to drive traffic to it. Email your customers to follow up on their most recent experience with your business. Ask them to take a minute and visit your Reviews page. From there they can click on the Reviews site of their choice or leave a review directly on your website. Set up a review station in your office or store. Google particularly will red flag reviews made by multiple customers from a single IP address and they probably won’t be accepted. Start a flame war. Use great care when handling negative feedback. Every business eventually gets negative reviews. Your first reaction may be to respond directly but this almost never turns out well. In the vast majority of cases your best course of action is not to respond. But if you do respond be professional and polite at all times. Flame wars will just inflict more damage to your reputation. Most people can read between the lines; if you have 98% positive reviews they’ll understand that you can’t please every customer every time. Exceed customer expectations. When you fail to meet customer expectations they might go out of their way to write negative reviews. When you continually exceed customer expectations they’ll go out of their way to share the experience with others! Make it easy for customers to post reviews. This is why the Reviews page on your website is so important; use it to display existing customer reviews and direct customers to post new reviews on Google Plus, Yelp and other sites that your prospective customers may use to research buying decisions. Follow up with customers. If you have provided a great customer experience go the extra step and follow up with them by phone, email or even a handwritten note. This provides a great opportunity for you to ask customers for feedback and encourage them to review you online. Combat any bad reviews with more great reviews. Eventually you will get negative reviews. In rare cases you may be able to get reviews that are false or defamatory removed. Again a few bad reviews do not mean your business reputation is tarnished. The best defense is a great offense; get as many positive reviews as you can and those few bad reviews won’t matter much in the long run! Customers are savvy. They want to know what others think about your products and services when researching and making purchasing decisions. In today’s hyperconnected world it may seem like everything has changed but word of mouth remains the primary way customers will find your business. The only thing that has changed is that word of mouth marketing has moved online. Now more than ever your business reputation is the most valuable asset your business can have. Before the internet one satisfied customer may have told a few others about the great experience they had with your business. Now they leave those experiences online for others to view literally forever. Google knows this; that’s why online reviews have become such a prominent signal in their local search algorithm. Google has little way of knowing which dentist, lawyer, plumber, pizza place, etc. is the best in any given locale other than by looking at the quantity and quality of your customer reviews. Hopefully these techniques will help you build a better reputation for your business. If you have other ideas on how to get positive reviews please post your comments below. ← What is HTTPS and how does it affect my site?